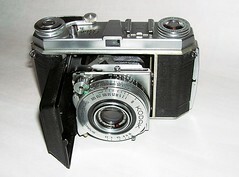 The Retina Ia (Type 015) was a folding camera for 35mm film made by the German Kodak AG. It was introduced in January 1951 as a revision of the Kodak Retina I. Its main new feature was the rapid winding lever. The cameras of the Retina I series had an optical viewfinder but no rangefinder. From January to May of 1951, the camera was fitted with a COMPUR-RAPID shutter and was coupled with a Retina-Xenar 50mm f/3.5 lens. A film glide roller on the back door was also added and this remained present until the end of production of this model in April 1954. 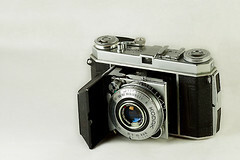 The Retina Ia was superseded by the Typ 018 Kodak Retina Ib in late March, 1954.